No matter how good your miniature tack is or how hard you prep ahead of time, disasters will occur at live shows. Be prepared! The following list is split into two sections: tack/model repairs and other goodies. Adjust the list to fit your showing style. WARNING: Some of these items are dangerous. Young showers should have their parents approve all items included in their Live Show First Aid Kit. Glue of your choice. I prefer Bond 5-2-7 as it dries fast (but not instantly) and holds leather, cloth, paper, etc. However, it does contain acetone. This is both hazardous to breathe and if placed on a model, can damage the finish. Use with care. ALWAYS read and observe the warnings on the label. Scotch tape. Some repairs may be patched (temporarily) with tape. This also cleans dust off suede seats. A craft knife. I prefer the X-Acto with a #11 blade. Remember: a good knife is sharp. Protect its edge and yourself by using some type of blade cover. Tweezers or needle-nose pliers. Better yet, both. For tweezers, get the kind with long thin tips. For pliers, a selection is nice, but you can get by with one pair of the flat jawed, unserrated type. I prefer to have a selection: unserrated, serrated, and smooth round nose. An assortment of leather lacing in the standard colors for use as replacement parts. If you show Traditionals, the 3/32 is a must. For smaller sizes, you'll probably want some of the 1/16. (Sure you can split the 3/32, but this is an emergency repair with a deadline!) If you want to be really prepared, get a yard of each of the following sizes: 1/16, 3/32, 1/8, 3/16, and 1/4. Some extra buckles and jump rings, assorted sizes. Pins: Straight and safety. These are often overlooked, but I've tightened up costume breast collars by pinning directly to the costume blanket. Scissors. I use the small embroidery type. They are sharp and don't take a lot of space. However, I don't use these on paper as it dulls them, so maybe a second pair for paper would be a good idea. 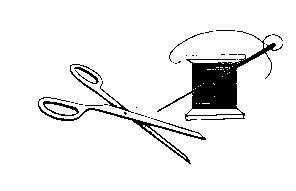 Needle & Thread. Some costume repairs can be sewn. I suggest black, brown, and white thread. To save space, you can wind a few yards of each on piece of cardboard. Clothes pins. Use these for holding glued items until they dry. A much better option than holding it yourself. The full size ones work, but check out the miniature ones in the Baby Shower section of your craft store. The Magic spoon tool (optional). My personal tack secret. This handy-dandy tool is my single most used item. I use it to stick glue in small places, clean up glue, smooth straps, etc. It is actually a modeling tool from Tandy. One end has a rounded point; the other has a small spoon. Acrylic paints in black, white, dark brown. A soft cloth. Use for dusting horses, tack, and for that final polish on hardware. An old ratty toothbrush. Usually, this is used to brush hair manes/tails into place, but it is also great for dusting OF models manes and tails and for smoothing out Arabian Costume tassels. Name tag. One for you; the little kind with strings for the horses. Camera with film and extra batteries. An Antihistamine, if you are subject to allergy attacks. Some shows are held in conjunction with real horse shows and the dust, horses, etc. can really stir up allergies and ruin the fun of the day if you aren't prepared. A snack. I like the fruit bits. Other good ideas are raisins, nuts, granola bars, cans of juice, etc. Avoid sugary stuff. You'll be able to get those anywhere, while things with a bit more staying power are harder to find. Hair Mousse. Does wonders with haired manes/tails. Table Cloth to cover your table. Some people decorate these with their stable name. Items for sale or trade. Model Horse Shows are great places to "horse trade" and it's fun! A real first aid kit. I try to keep one in the car.